Ideal for the aspiring guitar player, it works well for an advancing and professional as well. Hinged yoke, neck suspending guitar stand. Height adjustable with durable foam cushions on the yoke and leg rests. Take it out or leave it home, it provides secure storage and fast access. 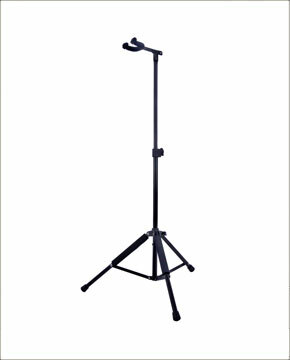 Hanging stand keeps the neck in tension to reduce possibility of warping. Yoke is hinged for ease of storage and travel. Mushroom ends on yoke to secure guitar.